something to translate that stream to whatever makes YouTube Live happy. The first part was interesting, as I had never done that before. Or to be more precise, I have obviously captured and published ton of WebRTC streams in these past few years, but I never tried mangling with the captured video on the browser side. I knew you could kinda use HTML5 canvas elements for this, but I had never played with it, so I decided to do that now. And boy, what fun it was! keep on drawing on the canvas as if there’s no tomorrow! Anyway, the cool part was that I had some basic video editing working in a test web page, and a way to use that as a source for a PeerConnection. The next step was getting this WebRTC stream to a server where I could play with this some more. 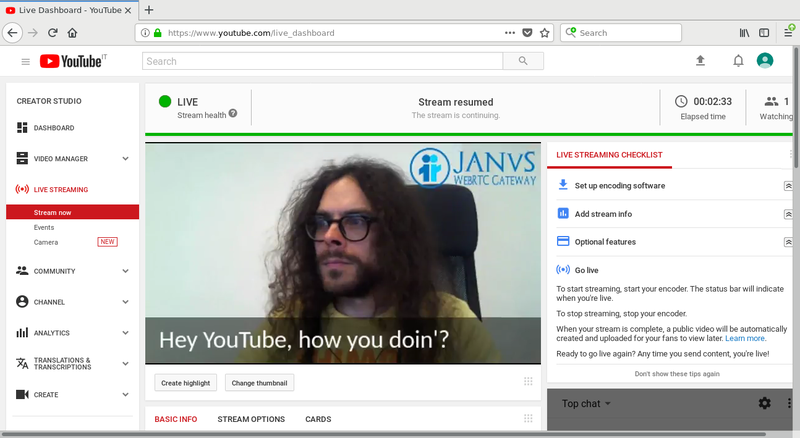 Unsurprisingly enough, I used Janus for the purpose… The idea was simple: I needed something that would allow me to receive the WebRTC stream, and then use it somewhere else. Considering this is one of the key reasons I started working on Janus in the first place, a few years ago, it was obviously the perfect choice! Specifically, I decided to use the Janus VideoRoom plugin for that. In fact, as anticipated I needed a way to make the incoming WebRTC stream available to an external component for processing, in this case for translating it to the format YouTube Live expects for publishing purposes. The VideoRoom plugin, besised its integrated SFU functionality, has a nice feature called “RTP Forwarders”, which allows exactly for that. I’ll explain later why and how it helped in this context. 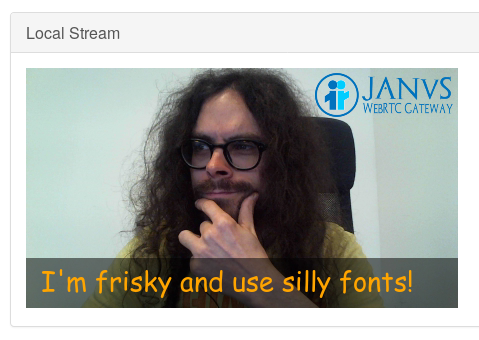 Finally, I needed something to translate the WebRTC stream to the format YouTube Live expects. As you may know, the traditional way to do that is using RTMP for the purpose. There are several different softwares that can help with that, but I chose to go simple, and use FFmpeg for the job: in fact, I didn’t really need any editing or publishing functionality (this I had done already), but only something that could translate to the right protocol and codecs, which is what FFmpeg is very good at doing. Obviously, in order for this to work, I first needed to get the WebRTC stream to FFmpeg, which is where the aforementioned “RTP Forwarders” can help. Specifically, as the name suggests “RTP Forwarders” simply relay/forward RTP packets somewhere: in the context of the Janus VideoRoom, they provide a way to relay media packets coming from a WebRTC publisher to one or more remote addresses using plain (or encrypted, if needed) RTP. Since FFmpeg does support plain RTP as an input format (using an SDP description to bind on the right ports and specify the audio/video codecs in use), this was the best way to feed it with the WebRTC media streams! FFmpeg as a transcoder (RTP-to-RTMP). That said, the last step was testing all this. It all worked as expected in a local test with good old red5 as an open source RTMP server, but clearly the real challenge was getting it work with YouTube Live itself. So I went to the dashboard for the Meetecho YouTube account, verified it, waited the usual 24 hours sipping a soda, and then got the required info to publish a stream. These basically consist in the RTMP server to connect to, and a unique (and secret) key to identify the stream. That’s it, really: no other “magic” needed. This could easily be turned into a service of sorts, by improving the editing part with some serious canvas job (what I did was really basic) and making the “RTP Forwarding + FFmpeg + YouTube Live credentials” part dynamic (e.g., in terms of ports and accounts to use), in order to support multiple streamers and multiple events, but the nuts and bolts are there. Yes, I know what you’re thinking: this is kind of smoke and mirrors, really. Meaning that yes, I’m using WebRTC to publish, and yes, it’s getting to YouTube Live eventually, but it’s not a direct step. What I did was basically taking advantage of the Janus flexibility to handle and process a WebRTC stream, by having an FFmpeg helper then do the actual broadcasting to YouTube “Ye Olde” way. Anyway, it’s still quite cool! The usage of an HTML5 canvas on the client side made it easy to somehow “edit” the publishing part, giving me quite some creative freedom. 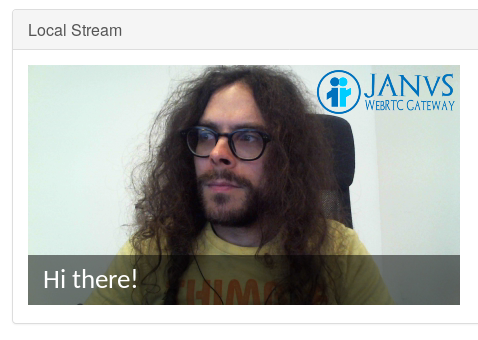 Besides, it still felt good to use WebRTC for that! I’ll also attend the OpenSIPS Summit in Amsterdam in a couple of weeks, to present a work done together with the amazing QXIP guys, so that might be a good opportunity to see this live as well. I love this tricks ! can i get example code for this post ? It’s all really messy because it was for a demo, maybe one day I’ll clean it up and put it online somewhere. Thanks for reading the post! Yeah, as I said in another reply I’d like to do that, but I’d have to REALLY clean up the code. As to FFmpeg and RTP forwarders, you may want to refer to our meetecho-janus Google group, where there are some suggestions on common tips. Can you provide us with the code? I can’t seem to understand the PeerConnection examples. it will be a great pleasure if you can upload your sample code Lorenzo.